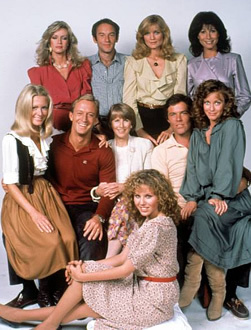 Performers include: Michele Lee, Ted Shackelford, Joan Van Ark, Kevin Dobson, William Devane, Donna Mills, Constance McCashin, Nicollette Sheridan, Pat Petersen, Julie Harris, Tonya Crowe, Larry Riley, Doug Sheehan, Lisa Hartman, Teri Austin, John Pleshette, Michelle Phillips, Victoria Ann Lewis, Kim Lankford, Stacy Galina, James Houghton, Kathleen Noone, Claudia Lonow, Kent King, Hunt Block, Steve Shaw, Lynne Moody, Alec Baldwin, Joseph Gian, and Lar Park-Lincoln. CBS initially turned down the idea for this series, wanting a series about the very wealthy instead. Following the success of Dallas, creator David Jacobs and producer Michael Filerman reworked the original Knots concept into a spin-off. Gary Ewing (Ted Shackelford) is the brother of Dallas’ J.R. and Bobby Ewing and is more or less the black sheep of the family. An insecure alcoholic, Gary had married Valene (Jon Van Ark) and they had a baby together when they were both very young. He left her and the baby, and the child was taken from Val and raised by Gary’s parents. Gary and Val eventually get back together and remarried, with his mother buying them a house in the Knots Landing cul-de-sac in California. Their daughter, Lucy (Charlene Tilton), stays at the Southfork estate in Dallas. Gary finds employment with Knots Landing Motors and is quickly promoted. The business is owned by Sid and Karen Fairgate (Don Murray and Michele Lee), Gary and Val’s neighbors. The Fairgates have three teenage children together; Eric (Steve Shaw), Diana (Claudia Lonow), and Michael (Patrick Petersen). Richard and Laura Avery (John Pleshette and Constance McCashin) also live in the cul-de-sac. They are the parents to a young boy named Jason. Sid’s much-younger sister, Abby (Donna Mills), also takes a job at the car dealership. She spends a lot of time meddling and makes sure that Val finds out that Gary had an affair with Judy Trent (Jane Elliott), the wife of the man he was sponsoring in AA. Abby wants Gary for herself but settles on an affair with the very willing Richard. Kenny and Ginger Ward (James Houghton and Kim Lankford) are young newlyweds, living in the Knots Landing cul-de-sac as well. Kenny is a record producer who is prone to having affairs. During its run, the show explores several social issues that were usually not explored by primetime soaps of the day. They include prescription drug abuse, abortion, homelessness, the environment, illiteracy, the Special Olympics and child abuse.